The purpose of this data is to give an easy experience "Corporate ITS" which is aiming the safe traffic society by communicating between vehicles and between the devices set on roads and vehicles. This system was showcased at ITS World Congress in Detroit. 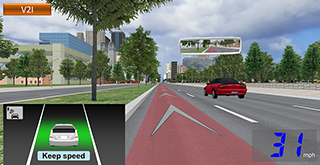 In addition to the transmission system between cars which the practical experiment is conducted in USA, the In the created VR environment, the highway and downtown in Detroit is reproduced in a high-precision VR environment. Combining with hardware via 6-axis motion platform makes the environment more improved when experiencing it. 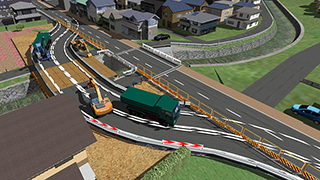 "Simulation for environmental upgrading around Higashi Takase river"
The improvements to the surrounding environment of Higashi Takase River flowing along the west side of the school is one of the regional challenges. A group of students considered to devise a plan for the improvements as part of a task of their research project. The students modeled and simulated the kind of river environment the residents of this region wishes to have based on their responses to the interview and questionnaires the students conducted. They came up with the phrase "A river that brings people together" as the theme of their research project. 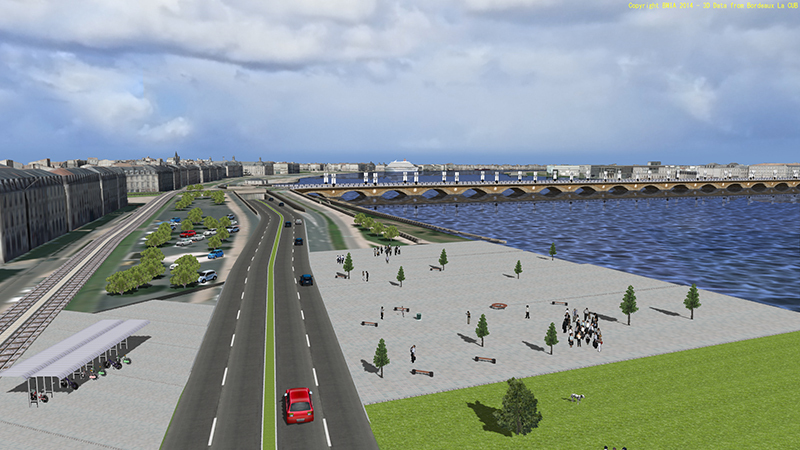 They devised an integrated environment that incorporates a park located in the premise of an apartment building into the entirety of the environment surrounding the river as the improvement plan. 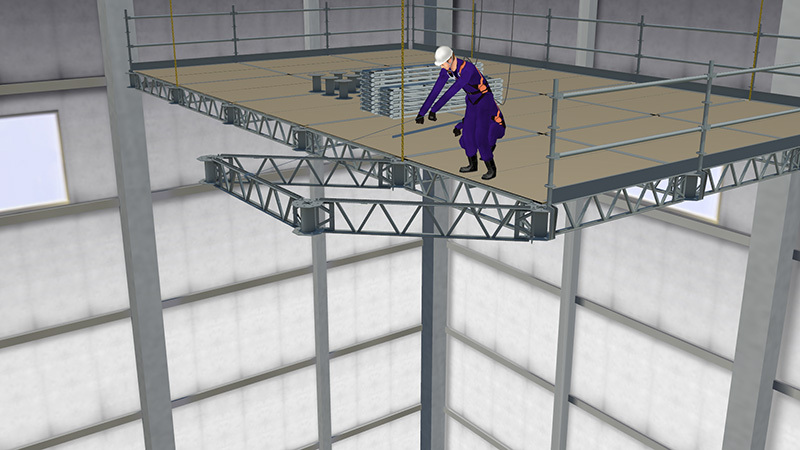 This VR data was designed for the promotion of a new type of scaffolding constructed in a new manner. 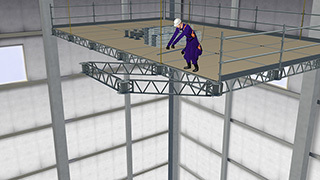 The interior of the plant and beams were modeled as part of the 3D VR environment to highlight the strong features of the new scaffolding that do not exist in any other scaffolding. By allowing people models to interact with the moving scaffolding, the work flow of assembling the scaffolding can be confirmed. This driving simulator is designed to give the general public an opportunity to experience what's it like driving through roads equipped with Driving Safety Support Systems (hereafter, DSSS) which include sensors mounted above each roadway or alongside it that alert drivers via in-vehicle units. 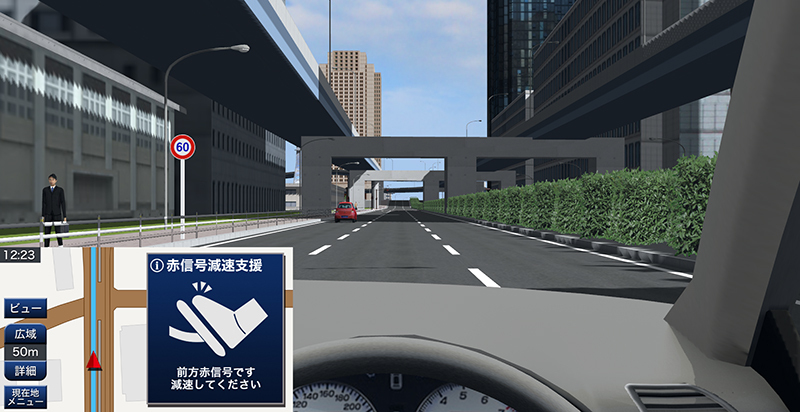 The driver can drive along several courses which are mirror reflections of their real world counterparts reproduced within the 3D VR environment and choose one of 6 different types of scenarios to experience. By comparing the behavior of the vehicle that has in-vehicle units with other vehicles that do not have such units, the effect of DSSS is visualized intuitively. "Residential Building Design VR Simulation for N House"
A case study in which VR was used for housing design. It was used not only for design of the appearance and inside but also for checking the view from the surrounding in terms of privacy issue. CFD analysis was separately conducted and then the temperature distribution and wind flow via air conditioning system were visualized. Checking the site via AR was also conducted and, in the future, VR-Cloud will be used for the conferences with owners. 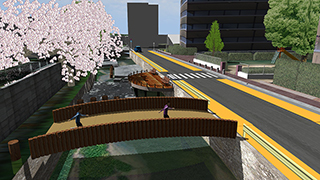 "Construction VR Simulation for the bridge replacement"
This VR model was designed to run a 3D simulation that visualizes the entire process of a bridge replacement construction work over a second class river from the planning of construction to the completion of the work. 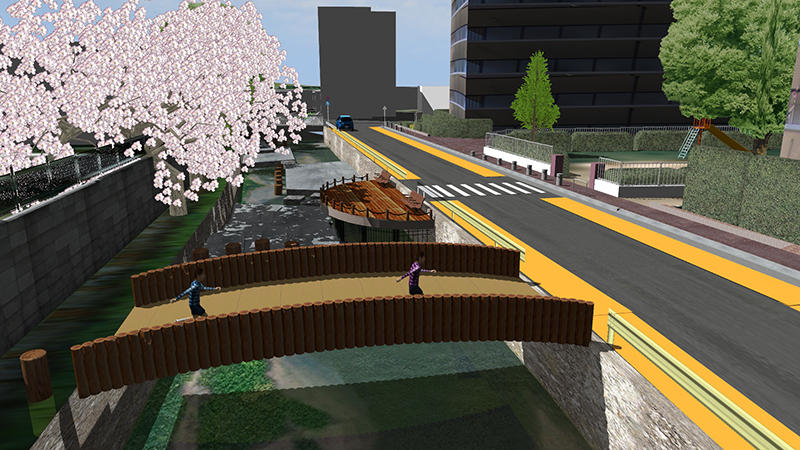 The 3D simulation includes the visualization of the construction steps to build a temporary bridge as a detour for cars to cross over during the bridge replacement construction work, the construction steps to install the girder of the superstructure at night time, and the plan to divert traffic due to construction. 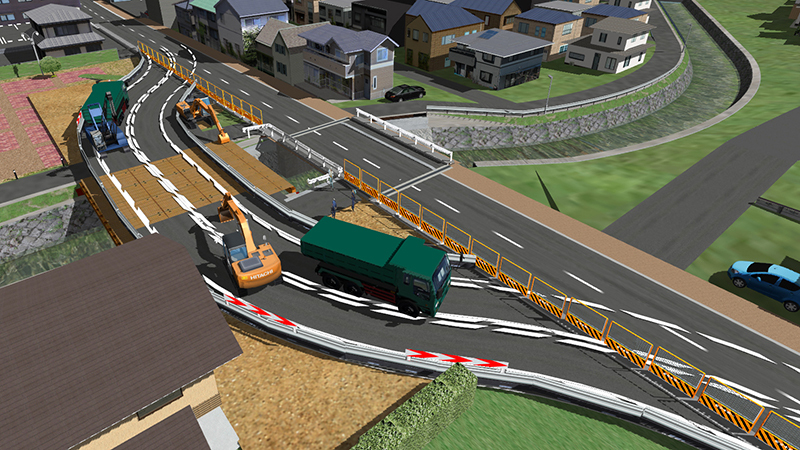 The scene of night time construction and the visibility of a driver driving on a detour can be verified within the 3D VR environment, the whole data being designed with the ultimate goal of running the discussion among stakeholders more smoothly and to obtain approval from the residents. 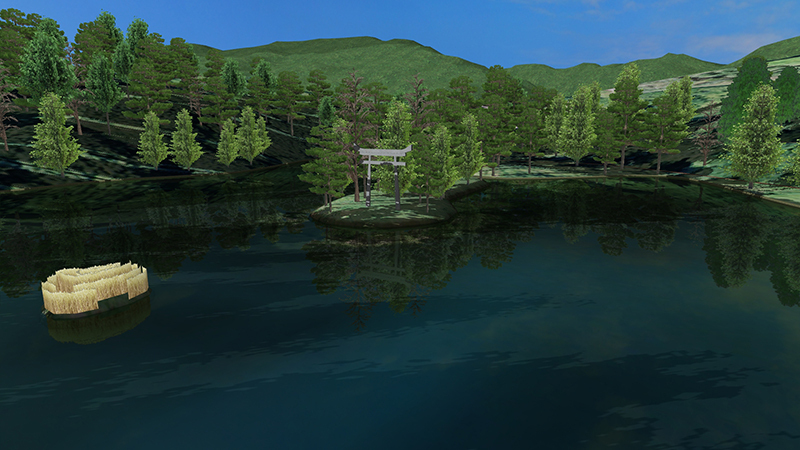 ONUMA-NO-UKISHIMA (Onuma Floating Islands) located in Asahi-cho Yamagata Prefecture in Japan, was discovered in 680. The pond whose shape resembles a gourd encompasses about 60 islands scattered all over the place and was designated in 1925 as Yamagata's first National Scenic Area. With the order-receiving for perimeter survey of a pond as a start, the nearby shrine and bridge which is said to bring romance, the top-down and birds eye view which are not actually happened and the island's floating situation are expressed in VR environment. 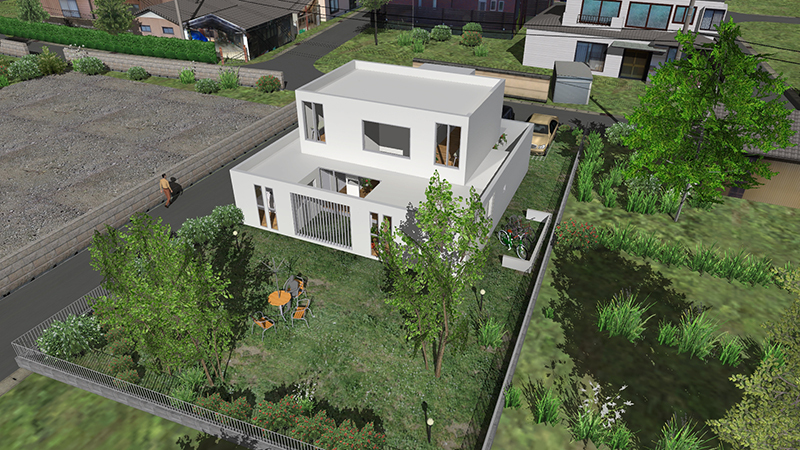 Moreover measuring the point cloud can make it realized to express the more realistic data. 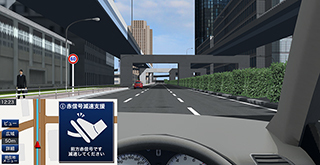 "Driving support agent VR simulation"
This data is intended to research development of next-generation cooperative driving support agent simulation via VR environment. 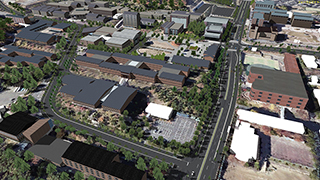 A movable 3D measurement system make it possible to create VR data based on the measured point cloud information and to reproduce the inside of the campus which is used as a testing site for sensing a high degree of accuracy. The advanced research can be now conducted by equipping with a driving simulator with the parts of actual vehicle and an omnidirectional camera / laser unit and building the system combined with a micro-mini electric vehicle which can be automatically advanced controlled. The realistic immersion of the users allows to test without constraints their reactions in front of various situations: accident, pedestrians' crossing, difficult weather conditions, heavy traffic... Wit h a touchpad command interface the trainer checks the whole simulation via a simple interface. He can inject events into various places of the driving route, modify weather conditions, etc.... He can also ask questions (MCQ) to the trainees through their own interactive tablet that they can use to interfere with the VR as well as answering the questions. A full report of the training session with C02 equivalent emission, fuel consumption and time reactions to event is available on real time. 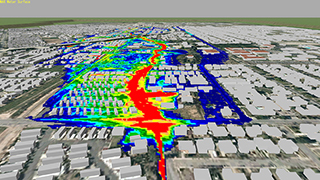 "Redlands California Flood Analysis Project using VR"
The downtown area of Redlands has been plagued by flooding with water of over 1 to 1.75 meters in depth contributed by four major watersheds that surround the area and undersized aging infrastructure incapable of handling water of such depth flooding from the watersheds for over 125 years. The City of Redlands requested a comprehensive study to identify potential improvements and their potential impacts whose results can be used to establish flood risk maps in addition to establishing a basis for future Drainage Impact Fees, and a solution can support public approval. In response to this, Michael Baker International, in the course of the project ordered by their client, analyzed the flood hazards within the Redlands area larger than 2 square kilometers for the 100-year storm event, and the risks associated with not improving the existing storm drain infrastructure with the DTM surface that is linked to the City's existing subsurface storm drain system by creating a 1D/2D hydraulic model using xpswmm (a comprehensive software package for dynamic modelling of stormwater, river systems, floodplains, and sewage systems), and imported the analysis result into VR-Design Studio to graphically show the flood hazards and the risks as 3D animation. 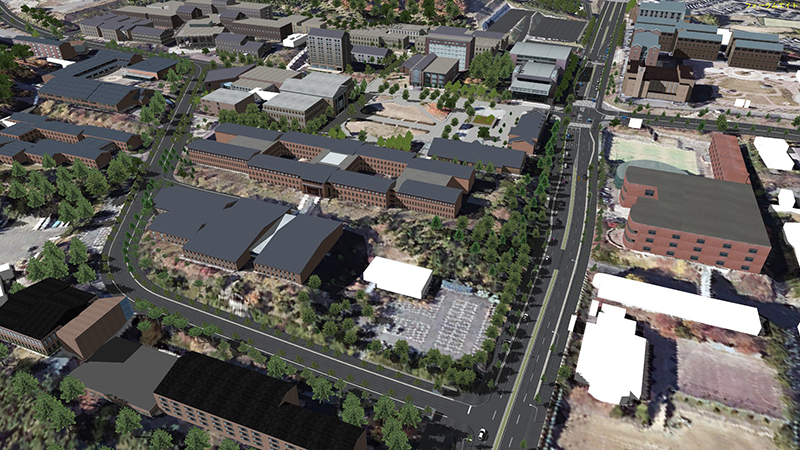 Sketchup building models, detailed aerial photograph, roads, trees, lights, and a railroad were also included in VR-Design Studio's 3D environment to make the scene even more realistic. The 3D-hybrid animation created through this project depicting a link between xpswmm and VR-Design Studio were also presented in an International Floodplain Conference, and successfully play a big role of building consensus among the stakeholders and communities to increase the city's Drainage Impact Fees. VR data created for the driving experience simulator for showcasing at a PR facility. 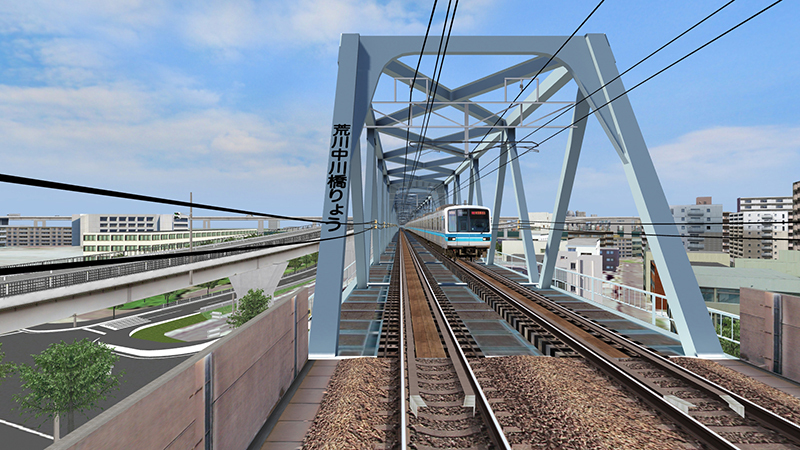 The both up and down trains from Nishi-Kasai Station to Minami-Sunamachi Station on the Tokyo Metro Tozai Line is expressed in VR environment. It is possible to experience driving to the next station and even passing on a bridge and in a tunnel. 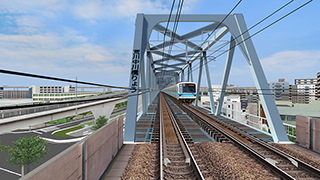 Evaluation will be displayed according to how accurate the driver could stop the train via Scenario Function.